First there was Edwin A. Abbott's remarkable Flatland, published in 1884, and one of the all-time classics of popular mathematics. Now, from mathematician and accomplished science writer Ian Stewart, comes what Nature calls "a superb sequel." 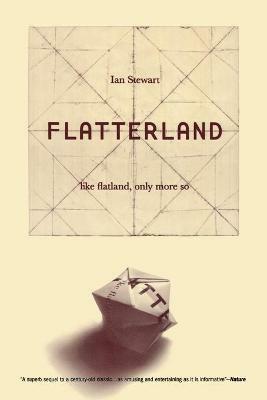 Through larger-than-life characters and an inspired story line, Flatterland explores our present understanding of the shape and origins of the universe, the nature of space, time, and matter, as well as modern geometries and their applications. The journey begins when our heroine, Victoria Line, comes upon her great-great-grandfather A. Square's diary, hidden in the attic. The writings help her to contact the Space Hopper, who tempts her away from her home and family in Flatland and becomes her guide and mentor through ten dimensions. In the tradition of Alice in Wonderland and The Phantom Toll Booth, this magnificent investigation into the nature of reality is destined to become a modern classic.